Ensuring your online safety is getting more important by each passing days. I come across several people, who will keep on running outdated and un-patched software and browsers, keep on downloading pirated software from torrent sites, continuing sharing files through p2p networks like Kazaa and give a damn thought about the online safety and PC security. Please be advised…things are too complex these days. It is a known fact that malware developers and online threats are getting smarter and smarter and security agencies and vendors are looking to be fighting a increasingly difficult battle to combat them. In such situations, you cannot rely on any security software for providing you complete online security. Remember, your online safely is in your hands, and you have to be vigilant, cautious and circumspect in your approach, while being online. 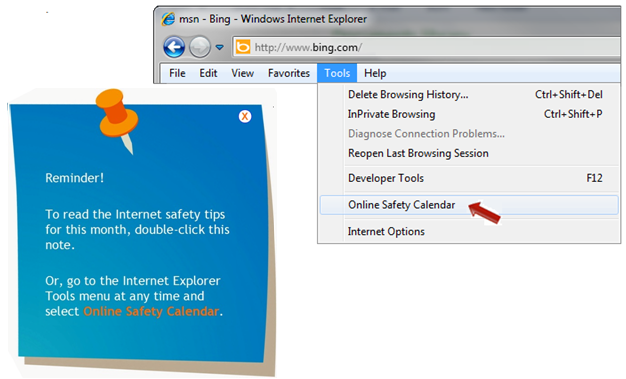 Microsoft has sponsored the creation of a new, free, Internet Safety Calendar application, that consumers can download to their Internet Explorer browser (Note: only IE is supported at this time). Built by LOOKBOTHWAYS, the calendar provides relevant monthly advice to help you increase your online safety whether you’re looking out for your own safety, or you are a parent watching over your family’s safety. The calendar also includes reminders for recurring those safety actions you know you should be doing, but that frequently get forgotten in the rush of day-to-day activities. Each month, the calendar will send you a note reminding you to check the calendar for important online safety advice, but you can also view the app at any time by selecting Online Safety Calendar under the Tools menu. But remember, this calender works only with the Internet Explorer. I have tested it with IE8 and IE9 Beta. It is not working with IE9 BETA and I have not tested with any other versions.